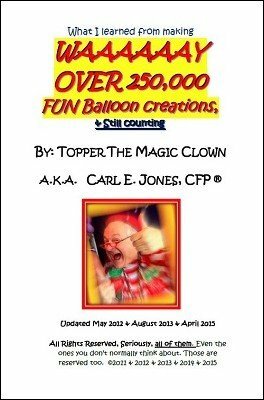 In this ebook Topper shares everything he learned about the business and entertainment side of twisting over 200,000 fun balloon creations. What you MUST do and what you should NEVER do if you want to make money twisting. How to turn a 6 cent balloon into a $20 creation in 3 minutes! Seriously! My FAVORITE gags! And these ARE my best ones! 1st edition 2011; 154 pages. 2nd edition 2012, 188 pages, 3rd edition 2013, 213 pages. This ebook does contain some very helpful information from a sincere working professional. Only gripe I have is that it could have been published on a lot less pages if the font was smaller. You'll know what I mean when you purchase it. This ebook is not just for the balloon worker. I found some useful tips that will enhance my style of entertaining children in general. Thankyou Topper!